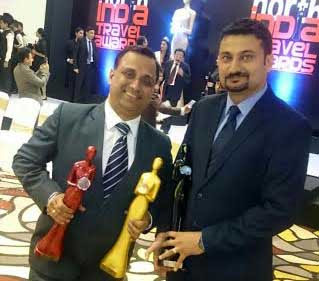 Jaipur : Low Cost Carrier segment, AirAsia India, is proud to receive 2 prestigious awards at India Travel Awards – North, held on the 8th December in Jaipur. AirAsia was awarded ‘Best LCC’ & ‘Face of the Future (Mittu Chandilya) at the ceremony. India Travel Awards is an all-India platform to recognise and felicitate those behind the success of the Travel industry. For the first time in the history of travel awards in the County, these awards have been decided based on internet voting making it most fair and unbiased. Supported by Ministry of Tourism, Government of India and many esteemed trade bodies like WTTCII, PATA, ADTOI, ATOAI and OTOAI etc., it is one of the most prestigious awards in the travel industry. The exclusive event witnessed region-wise ceremonies across the South, East, West & North through the year. Mittu Chandilya, CEO & MD, AirAsia India said, “It is extremely encouraging for us to have been awarded in 2 categories. The AirAsia Group is recognised across the world for its low fares and we at AirAsia India are proud to be known as the ‘Best LCC’ in the India Travel Awards." AirAsia India currently flies to Bangalore, Goa, Kochi, Pune, Chandigarh, Jaipur, New Delhi, Vizag, Guwahati & Imphal.